We strongly believe in processes before tooling and have designed DealMatrix on that belief. Software should never force you to change your process and flexibility is core to our Unified Innovation Management Platform. To facilitate as many different process types, use cases and activities we introduced the tagging system at the beginning of this year. It gives you the flexibility to implement your processes in DealMatrix any way you feel comfortable with. A common use case has been to use the tags as process steps, e.g. Accepted, Rejected, To be Evaluated etc. These tags are commonly mutually exclusive and represent a linear process. Up until now working with process tags was not as efficient as we had liked and we started looking at solutions that streamlined the experience without losing the flexibility our users have become accustomed too and today we’re happy to announce our new pipeline display. Next to our existing table and charts display in pipelines you can work with using a process view, moving companies between stages and the system takes care of tag management. Filtering and view management works as you would expect and you can define any number of pipelines and share them with your organisation. As the feature set in DealMatrix has grown we’ve decided to restructure the navigational elements. The top most navigation switches between parts of the platform, i.e. Dashboard, Search, Workspaces and Settings. 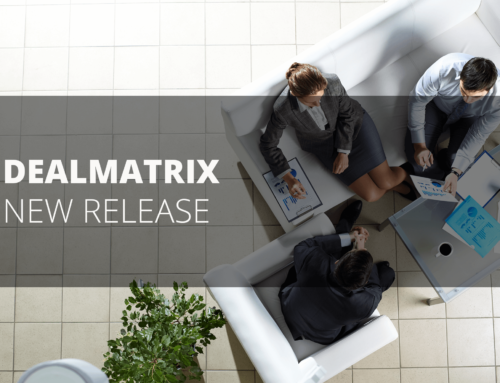 DealMatrix now lets you offer mobile optimized access to all or a subset of companies in your database for public or password protected consumption. the public catalogues allow you to not only define which companies are publicly shown but also which properties for those companies are displayed giving you the possbility of hiding sensitive information such as e-mail addresses or people’s names whilst still giving enough access to assess the interest in the company.